As of September 2cnd Gemma now lives at a new barn. It feels like a lifetime ago that I came to the difficult decision to do so after much prayer, thinking, and talking complaining about the drive to the previous. I was told when I first moved Cocoa to an hour away barn in Illinois back in 2010 that I would eventually burn out of the drive. He was there just over three years and then moved to a barn in Missouri that was an hour away and that was another three plus years. I kept Gemma at the same barn since April and slowly but surely the burnout turned into something very real. So, yup, my friends were right. This lead me to start searching for a barn that would be closer because not only was the drive getting to be too much for me due to my RA but also I want to see my girl more than maybe once or twice a week. We'll never get anywhere with training if that is all I can do. So when my parents visited last month I had a day set up where my mom and I went and looked at barns. I spent the previous month looking for barns that looked like they fit my criteria. The day after we had done the looking I drove back out to one and put down a deposit on a stall for Gemma. The only thing they didn't have is grazing but they had everything else. Plus the price was right and the description of care sounded great. This only left me with finding Gemma transportation. That ended up falling in my lap when I asked a friend how/who she used to move her horses. She and her husband offered and gave me a date when they could do it. So the deal was set and while I was excited about the new place and having Gemma closer, I was also fighting a lot of fear of letting someone else take care of her. The only thing I then had some concern about was how well Gemma would get in the trailer. I needn't have worried because she got right in and rode extremely well. The above pictures were taken as she unloaded at her new barn. The blue things on her legs are pillow wraps that I put on as an in case type of thing. We arrived at the new barn at about 11 a.m. and then I spent the next several hours with her. I let her graze for quite a while and also walked her around to help her get used to her new surroundings. Also after her hour and a half ride in the trailer it was good to let her stretch her legs out. By the time we left she looked as if she was going to fall asleep in her stall. I went back out the next day to check on her and see how she was doing. I got a very cute hello from her and Gemma seemed utterly content in her stall. She was so calm already that I went ahead and lunged in her in the indoor arena. For her not being real used to her surroundings, she did awesome. I was/am very pleased with her. With Monday being a holiday, I decided to spend time with my husband that day and then went back out Tuesday to see Gemma again. She gave me a nicker and a friendly hello (really she just wanted food). So I took her out and let her graze for a while and then we went for a walk down the road. She did very well and I was again very happy with her. We also did some lunging in the indoor and I even gave liberty lunging a go. She seemed to enjoy that a lot. This last Sunday there was a barn meeting for boarders to help get everyone on the same page with rules and such. Well, with it being at 6 p.m. and my not being able to drive at night, my husband had to take me. 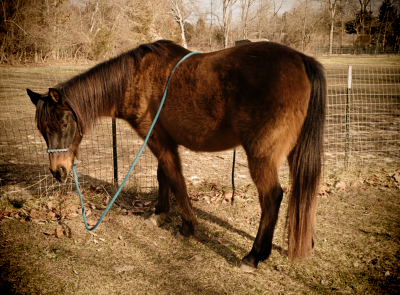 I got him to help me groom Gemma and take a few pictures of her and I while I lunged her. He agrees that she seems very content and settled in already. I've been able to work her more consistently and see her too and she's not been there quite two weeks. This shorter drive is oh so very nice and seeing my horse happy is also! I think she's enjoying the extra human interaction she's receiving and having a very routine schedule. God did a wonderful job of orchestrating this entire event and I look forward to seeing how things continue to go at this new place. In the meantime I'm enjoying my new adventure with my girl and look forward to our bond growing now that I've been able to leave some emotional things behind.